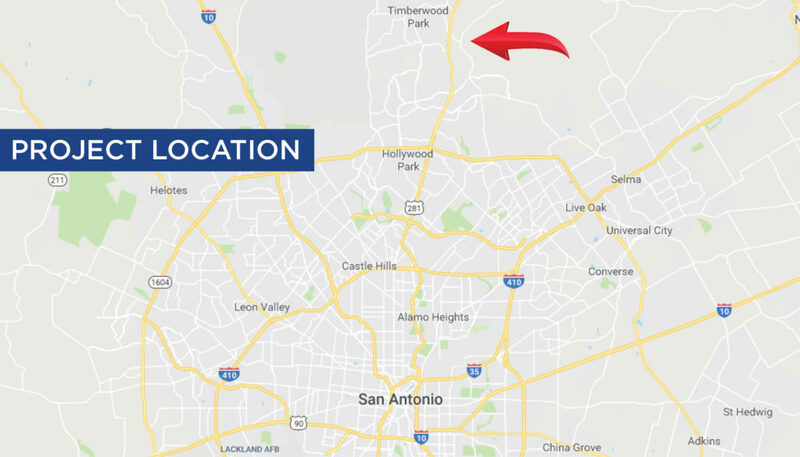 Bulverde Road in Bexar County, Texas, has become a major travel route for commuters and residents attempting to avoid the increasing congestion of the US 281 corridor in San Antonio. 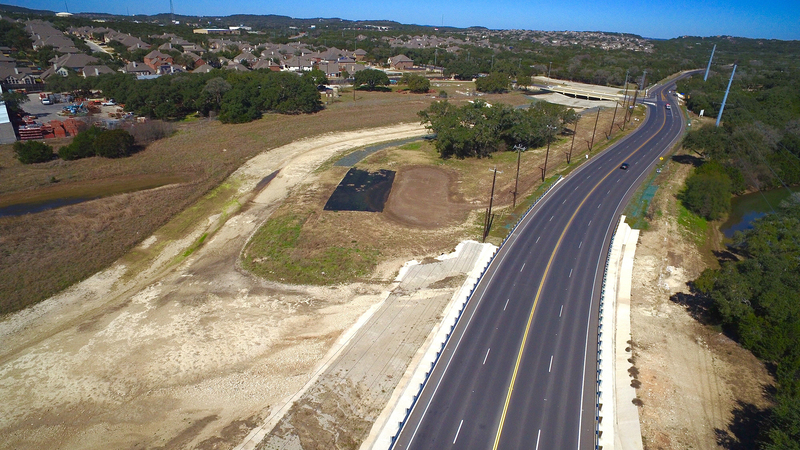 A section of Bulverde Road north of Loop 1604 and east of US 281 was the focus of Phase V, a needed transportation reconstruction project of an existing rural two-lane asphalt roadway that experienced frequent flooding in three locations over Elm Waterhole Creek. The flooding events required Bexar County to close this section of Bulverde Road, forcing local traffic to divert several miles to the nearby US 281 facility. Additionally, increased traffic volumes posed a significant safety concern for area residents and the traveling public and reinforced the need for added capacity to improve safety and mobility. Halff Associates was the prime consultant and provided engineering and technical design services for conceptual design and evaluation of alternatives, the preparation of plans, specifications and estimates (PS&E) and construction observation services. 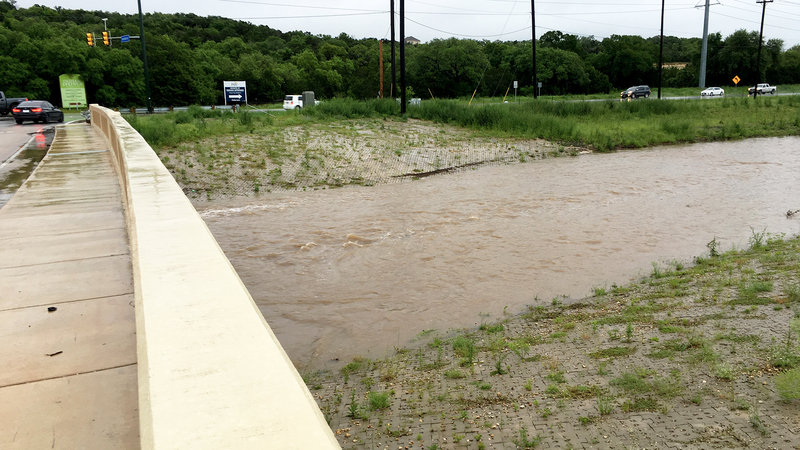 This innovative and creative design solution was developed to convey and contain stormwater from Elm Waterhole Creek, alleviate roadway flooding during the 100-year storm event and preserve a sensitive wetland immediately downstream of the roadway crossing. The bottom photo shows the new bridge structure and bypass channel utilized to alleviate flooding of the roadway. 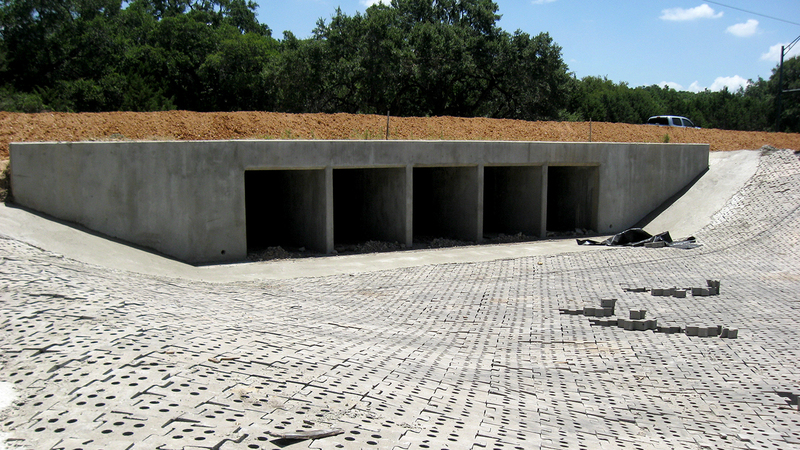 The Phase V project on Bulverde Road was located over the environmentally sensitive Edwards Aquifer Recharge Zone (EARZ) and required special attention during design to satisfy the Texas Commission on Environmental Quality’s permanent stormwater treatment requirements. Vegetated roadside ditches and grassy swales were used to treat stormwater runoff by capturing pollutants from roadway traffic. Only natural, vegetated treatment features were used, contributing to the goal of promoting a “green” project and eliminating the need for required annual maintenance. The existing topsoil was removed prior to construction and stockpiled to preserve the native seed mix. At the completion of construction activities, this stockpile of native material and seed mix was used to “reseed” the project site to re-establish native vegetation. Reseeding the project was accomplished using the voids in the concrete cellular erosion control blocks, which lined the channel banks and outfalls to provide protection against high-velocity, erosive conditions. The bypass channel was lined with concrete cellular blocks in key locations to protect it from erosion. Additionally, an existing wetland of 0.9 acres located immediately downstream was identified and protected during construction. Wetlands are protected and regulated pursuant to Section 404 of the Clean Water Act in part for their ability to filter and cleanse pollutants and sediments from stormwater runoff. Halff’s innovative design approach of constructing a bypass channel within an existing drainage easement adjacent to the roadway was used to protect and preserve this quality wetland. Tree preservation was also carefully considered during design and construction. A comprehensive tree inventory survey was conducted, and the proposed bypass channel was designed strategically to avoid removal of several heritage trees and preserve several large tree clusters. 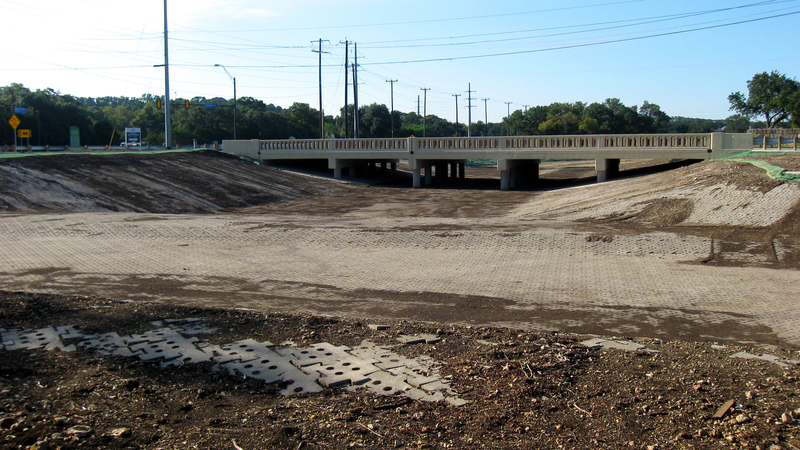 Utilizing Halff’s bypass channel design concept, Bexar County accomplished the goals of the project of removing the roadway from the 100-year floodplain and improving safety and mobility. 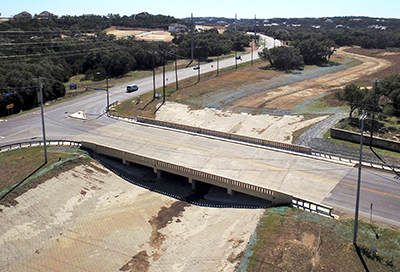 This innovative design solution saved Bexar County hundreds of thousands of dollars that a more traditional design approach of raising the roadway and constructing two new bridges to remove the facility from the 100-year floodplain would have cost taxpayers. 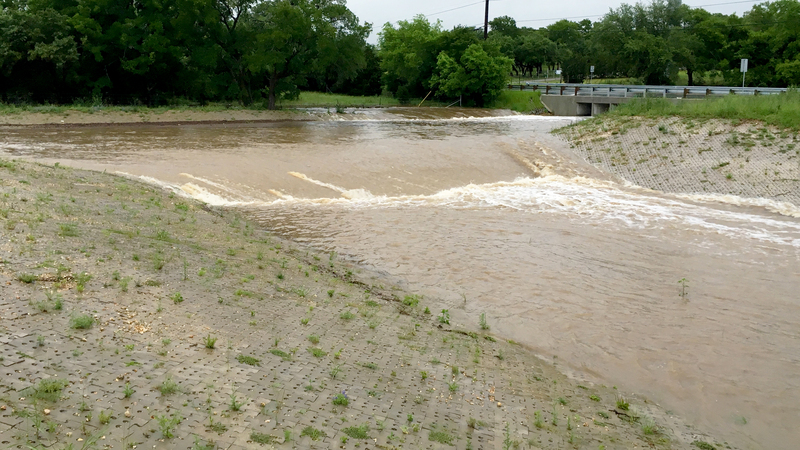 Purchasing three parcels of adjacent property to construct the bypass channel—all of which were in the existing floodplain, and two were recorded drainage easements—was more cost effective than constructing two new bridge structures. Additionally, significant environmental issues were avoided by implementing the bypass channel design rather than impacting a quality wetland environment immediately downstream. 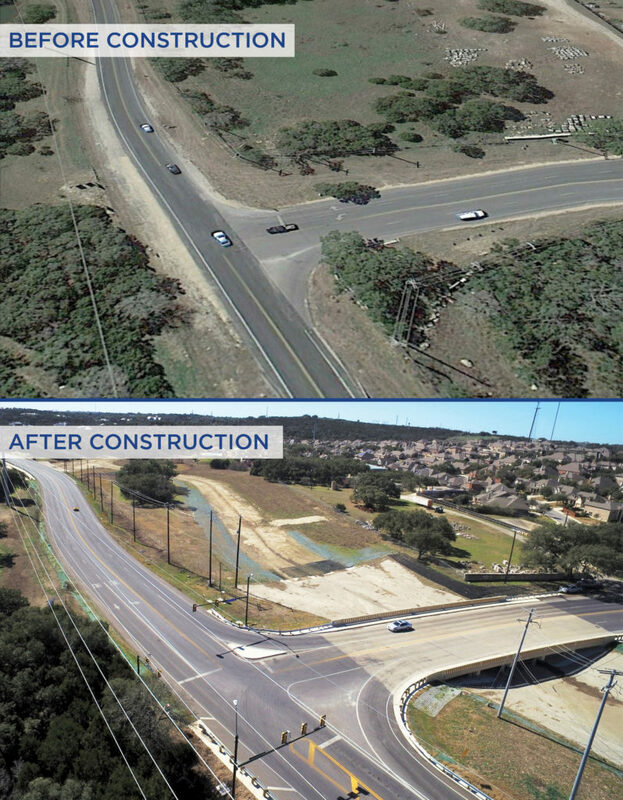 KSAT news report: How did the project hold up during a heavy storm? Bulverde Road Phase V is an excellent example of a successful public works project that applied innovative engineering design solutions and partnering techniques. Bexar County Public Works and Halff worked together closely during the design phase to keep the public informed of proposed plans. Two public meetings were conducted prior to construction, allowing area residents and the traveling public an opportunity to discuss questions or concerns. Additional meetings were held with adjacent property owners to discuss the improvements and impacts encountered during construction. “Communication with Halff’s team was fantastic on the project, as it has been on every project they have been involved in,” Fountain said. The effort resulted in a highly beneficial project that added tremendous value to the local community and traveling public. For more information about how Halff can create custom solutions for you, write to Info@Halff.com.